• A CE-approved platform equipped with an AL-Vac® Minicrane powered by a 12 V battery. Max. 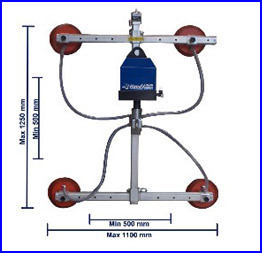 lifting capacity is 250 kg and working reach is 2 meters. vacuum unit and an adjustable suction boom with four suction pads. Max. weight of windows is 250 kg. • Battery and battery charger is installed into the platform. This design makes the AL-Vac® WinLift completely independent of the telescopic handler. 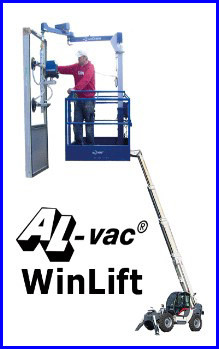 AL-Vac® WinLift is equipped with acoustic and visual alarm for low vacuum pressure. 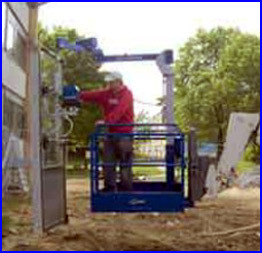 The window lifter is easily attached to the fork carriage of the telescopic handler.